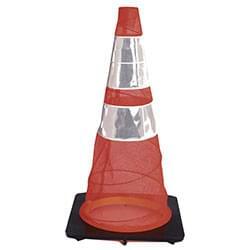 The Enviro-Cone is MUTCD Compliant, 80% recycled by weight, made from low density polyethylene, recyclable when damaged or destroyed, and provides superior all-weather performance and increased life span compared to PVC Cones. 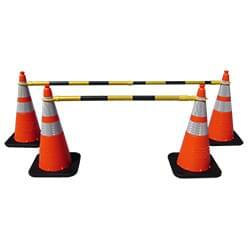 The Retractable Cone Bar improves safety in your work zone by creating a visual and physical pedestrian barrier. The retractable bar is made of durable ABS plastic and wrapped in reflective sheeting for increased night-time visibility. 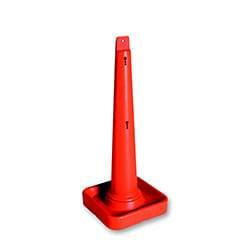 The TrafFix PVC Cone is Injection Molded, MUTCD Compliant, and comes in 18" and 28" heights. PVC Cones are fluorescent orange in color and has excellent stability and anti-skid performance. The TrafFix Spring Cone & Tote System is an ideal solution for temporary traffic control with its compact design for easy storage on any truck, or vehicle trunk. 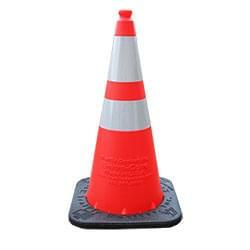 The Spring Cone meets Federal MUTCD requirements for 28" reflective highway traffic cones. The TrafFix Cone is made of durable high density polyethylene plastic, the rugged TrafFix Cone has multiple uses in a wide variety of different applications. The cones are stackable for easy storage and transportation.